I asked the other American-based Slow Travel Tours leaders to join me in discussing packing for a European vacation. We’re all frequent travelers who often stay in Europe for several weeks at a time— and we’ve learned from experience. We’ve also watched travelers in our groups who packed smart… and those who wish they had. Whether you’re traveling with a small group tour or on your own, we hope our stories and suggestions will help you better pack for your next European vacation. What luggage do you typically take on one of your European trips? Cheryl Alexander – Italian Excursion: My typical trip lasts 3 weeks. I take one small rolling carry-on and a 22″ roller bag. I’ve had a Tumi suitcase for about five years that I love! It’s 22 inches and the corners are rounded (which makes it easier to carry on if I wish to do so), so it’s smaller and easier to maneuver than a square bag. It’s sturdy, but not heavy, a distinguished gray color (not another black bag), and has plenty of room inside with many, many compartments and zipper pockets. Having multiple compartments is a great way to stay organized. Matt Daub – Arts Sojourn: We try to travel very light, whether our trips are for three weeks or a couple of months. What makes our packing different is that we must also include our art supplies and I also have to bring various handouts for our clients. If not for our art supplies, which we also try and pare way down, I could easily survive with one approved carry on. As it is, I usually put my art supplies in a day pack and place that inside the carry on which I usually check through. This is in addition to one suitcase that is usually half empty. I occasionally put the carry on inside the suitcase and check it all through as one. That way we have room to bring back purchases we make in Italy. We have been able to bring home large ceramic pieces and tableware sets, clothing purchases, etc. Anne Woodyard – Music and Markets Tours: Our European trips vary from three nights to seven weeks. For a shorter trip we carry 22 inch Briggs & Riley expandable rollaboards. (If needed, we can expand and check them on the return trip.) For a longer trip or one of our tours that requires dressier clothes (such as Music & Markets Prague that includes operas and concert halls) we take a 26 inch expandable, which we check. We love our Briggs & Rileys and have taken advantage of the lifetime guarantee. They’ve replaced the frame and expanding mechanism of both of our cases after hundreds of thousands of travel miles. We also really like the expandable feature. We can usually squish the case closed, unexpanded, when we start a trip in order to carry it on, then can expand it during the trip for easier use, and also for extra room if needed when we return home. 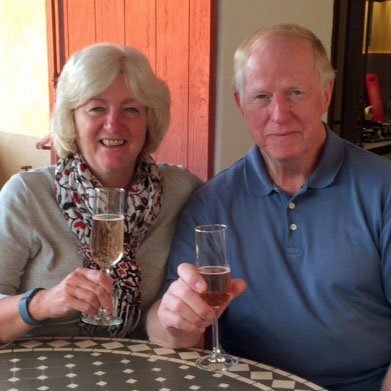 Bill Steiner – Adventures in Italy: We typically stay four to six weeks. We each take one piece of carry-on luggage as well as a small backpack. We check no bags. There is a lot of discussion about suitcases. Some people advocate no wheels and equipped so you can carry it like a backpack. The reason for this is to keep your weight light, because heavy bags wear you out traveling. Ultimately, however, most people are not going to put their suitcase on their back. A durable bag with wheels is the most practical solution. My bag is made by Eddie Bauer. I tried a Bauer wheeled duffel with a lower compartment separate from the top. I like it from a packing standpoint, however because the wheels are close together it is unstable when you pull it, particularly on the cobbled streets in Europe. So I am happily back to my wheeled Bauer carry on. Kathy Wood – European Experiences: In our early European trips, especially traveling with a young child, we always seemed to take too much luggage. If your suitcase is too big and heavy or if you have too many pieces of luggage, your trip can be much more stressful– especially if you’re traveling by train. Nowadays we travel to Europe a couple of times a year, including about 10 weeks every summer. Our trips sometimes require clothes for different weather conditions and activities and often involve some travel on trains or budget airlines where you must be careful about your luggage. We each take a rolling bag (usually 24” for these long trips) and a hands-free carry-on like a backpack or a shoulder bag. I also pack a small Rick Steves daypack for daily use during the trip. 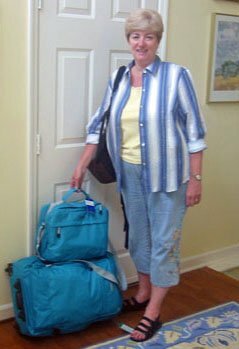 In this photo I was about to leave for a 59 day summer trip to France with just a 22″ soft-sided rolling bag and a carryon to sling over my shoulder. Note the very distinctive color! Normally we favor rolling, soft-sided duffle bag type luggage, with wheels. I like a bag with compartments to organize my stuff, especially helpful if we have some short hotel stays when we don’t unpack. A unique color is good because you can spot your bag easily. I don’t spend a lot of money on luggage since mine gets a lot of wear-and-tear. I’m still searching for my perfect bag. What are some of the most common mistakes people in your groups make with their packing and luggage? One couple that joined me on a trip brought one carry-on each, one 30″ roller bag each, and another, shared bag of about 22 inches. I had cautioned the wife about using a purse while traveling through places like as the train station. On their last day in Italy, about three hours after I’d seen them off on the train, they called in a panic to tell me they had been robbed. They had to keep track of, had taken her purse out to use in transit, and weren’t paying attention while trying to maneuver all of the bags through the crowds. Another thing I remind travelers is that there are no porters in Italy and they will have to carry their own bags. If you have too much luggage, traveling by train can get very difficult because most stations don’t have escalators to get from one track to another, just stairs. You can easily injure yourself trying to carry large, heavy bags up a flight of concrete stairs. Anne: We’ve had people forget an important wire to charge a laptop, camera or phone—and then they have to try to find one that fits in the country where we’re traveling. Another problem has been over-packing and then buying so many things that the luggage was overstuffed and broke the day the traveler was packing to go home! Bill: Quite simply they bring too much – often three bags. One time I arrived at the airport in Rome at the same time as three members of our group, and we traveled to Orvieto together. Between the three of them they had eight bags. Each had the very largest you can buy and a carry on. Two had a third bag. Being the only male, I ended up dealing with their eight bags and my one bag getting on and off trains, funicular and bus. They all felt terrible, but I survived! One of the things they did during the week was figure out how to downsize for the return trip. They each ended up sending a box home, which cost a small fortune. But, they recognized it was just too much trouble to be encumbered with lots of luggage. Kathy: Like the others, we’ve had travelers who brought too much luggage—too many pieces of luggage, oversized bags, and/or luggage that weighed too much. This is an especially big problem for people traveling by train. Some of the most stressful experiences in our early days of European travel were when we had to manage too much luggage on the train. We have learned since then! 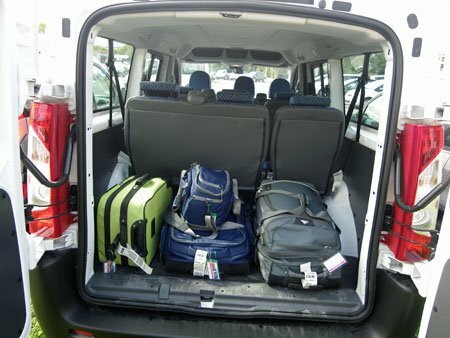 Too much luggage is also a problem in taxis and cars, which have limited space for luggage. We pick up our groups in vans, and we have limited space for luggage. I remember two recent travelers, a mother and daughter, both small women. They didn’t follow our guidelines and each brought an oversized rolling bag and two other pieces of luggage. There were seven of us in the van coming from the Marseille airport. The others had followed our guidelines, but we didn’t have room for all the mother and daughter’s luggage. They had to ride with their carryons in their laps, and I know it was an uncomfortable ride. They were also shoppers, and at the end of our week they had more bags of purchases. I remember watching them struggling with their luggage when I left them at the airport and wondering how they would manage during the rest of their travels. In contrast, we’ve had a number of travelers who have arrived with only a carryon bag, very sensitive to bringing only what they could manage themselves while traveling. Smart travelers bring lightweight clothing that they mix, match and layer, and they’re creative with accessories like scarves—and they always seem to have plenty of different outfits to wear during the week. These three people packed light. We have three more to pick up… hope they did too! Are there any important items you suggest people bring on a two week European trip? Cheryl: I tell people to make sure they have their “comfort” items with them. These are the things that make one feel at home, away from home and will be different for each person. For me, I need to have lots of books to read in my spare time. I buy half a dozen used paperbacks and leave them wherever I’m finished, though now that I have a Kindle that will change. For the plane ride, which is where I need to most support, I need my special wrap (a pashmina that serves as a blanket and a fashion item), a neck pillow and a few antiseptic wipes, as well as an air sickness RX. A small journal to make notes or sketch in also makes me feel good. Having two sets/copies of all my documents makes me feel safe and prepared. Other than that I find I can buy almost anything else necessary when I’m at my destination. Bill: I suggest bringing a small first aid kit that will help you deal with unexpected problems in the short term. Pharmacies are particularly helpful in Europe, should a bigger problem arise. Two other important items: a very small flashlight, because rooms can be dark and a line for drying clothes you wash.
Matt: We always bring a travel clothesline and plastic clothespins and hand wash detergent that we use regularly in our hotel rooms to keep our limited wardrobe fresh. Two other indispensable items to pack are a small travel alarm with a fresh battery and a reliable watch. It is important to be on time when you are traveling with a group. Remember that when you are traveling overseas your U.S. electronic devices will not work in most foreign outlets. Some people use adaptors and converters, but you may risk damaging an expensive device — be sure to check with the manufacturer if you have doubts. Kathy: We’re outdoors on our trips a lot, so sunscreen and a packable hat are important. I agree with Matt about the battery alarm clock and the handwashing supplies. 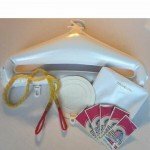 For handwashing I also take inflatable hangers that help clothes dry quickly. Ziplock bags are extremely handy on a trip, and I always take a supply of heavy-duty freezer bags in the quart and gallon size. You’ll be surprised at how many ways you’ll use them. You can enclose liquids that might leak, pack damp things, or seal food items. We use them as compression bags and a way to organize small clothing items like socks, scarves and underwear. I keep my trip receipts in a quart bag. Roll them up tightly with a couple of rubber bands for packing; you’ll find the rubber bands useful too. You need to have things to do in your room when there’s downtime: reading material, a puzzle book, a journal, a lightweight laptop, a deck of cards or small games. I’m a big reader while traveling, and having a Kindle has helped me tremendously. Is there anything people often bring on a European trip but should have left at home? Cheryl: Lots of electronic items seem unnecessary to me, and so do large cameras that are bulky to haul around and add weight to the luggage. With so many amazing small digital cameras (or phones) on the market today, great pictures are easy to get without a great deal of equipment. Leave behind heavy, bulky sweaters, coats or jackets. If the weather turns cold, I go to the traveling farmers markets and buy an inexpensive jacket, which I can leave for someone in town or at the airport before departing. Many people bring too many shoes! Who needs to bring a whole suitcase for shoes on a two or three week trip to Europe? I had a guest who did just that and she only wore three of the 12 pair. I would also leave valuable jewelry behind. The guests I mentioned earlier who were robbed at the train station lost several valuable heirlooms that they will never see again. They were heartbroken and obviously had not heeded the warning in our pre-trip instructions. We had one interesting woman who traveled with us. She brought only a small overnight rolling case with two pair of jeans, a couple sets of underwear, and sundries. She wore her sturdy shoes. The weather was mild so she had only a light wrap for evenings. She bought t-shirts in some of the towns/cities we visited and when they were dirty, she discarded them. That is traveling light! Kathy: Quite a few people on our trips leave things behind at the end of the week to make room for gifts and other purchases. Here are some of the things that have been left: large bottles of health and beauty products (such as a big bottle of contact lens solution and a large bottle of Tums), multiple heavy guidebooks, big athletic shoes, curling irons and hair straighteners, bulky items of clothing. None of these items were necessary for the trip. There is one school of thought that says you should bring old clothes with you to wear and leave them behind as you purchase new things on your trip. If you do this, just be sure to let your B&B or hotel know they are deliberately being left behind. Simplify your beauty routine and bring travel sizes—or buy things like shampoo, conditioner and toothpaste when you arrive in Europe. You can even buy an inexpensive and small European hairdryer at the supermarket and use this on future trips. Some people bring way too many health items, sometimes full bottles of over-the-counter drugs for every possible ailment. I know they want to be prepared for an emergency, but you can buy similar products at pharmacies all over Europe. If you want to bring the over-the-counter drugs you’re comfortable with, at least bring a reasonable amount for a vacation. For example, put 10 Tylenol in a small baggie or tiny plastic bottle instead of bringing a larger container. What’s your most important advice about packing for a European trip? Cheryl: Pack your luggage at least a week prior to departure, then go through all the items several times and remove things you know are unnecessary. It’s surprising but many folks tell me they will have removed about half of the original amount of clothing they started with. Women, limit yourselves to neutral colors that can be mixed, matched or dressed up with an accessory. Men, take twice as many shirts as pants/shorts. A two week trip requires only four or five bottom pieces and seven or eight tops. Anne: It’s wise to include in your small carry-on your camera, jewelry, medicines, a change of underwear, makeup, and anything else valuable, or that you absolutely can’t do without in case your luggage is delayed. Bill: When traveling for long periods, more than anything, you want to be comfortable. Part of comfort is not hauling around lots of heavy bags. Trying to prepare for every eventuality leads to overpacking. If you really discover there is something you need, you can buy it in Europe. Pack in one bag. Matt: Keep a list of everything you have packed, even the size of deodorant cans and toothpaste tubes. Upon your return write down what you did and did not use, what you should have brought with you and what you could do without. Then put your list where you keep your passport. When you prepare for your next journey, you will have a great head start and can eliminate unnecessary bulk. Do not overstuff your suitcase on the way outbound since you will invariably make purchases while you are traveling. Airlines today are much fussier about checked baggage. You may also be facing steep charges for additional or overweight bags. Kathy: Begin your packing with the size bag that you want to deal with; then limit what you bring to what will fit in that bag. Don’t cram it all the way full, so you have room to bring things home. You will still be surprised how much you can fit in. Regardless of the length of your trip, pack clothes for just one week: layer, mix and match, wear every piece several times, and handwash or do laundry when needed. My last suggestion: Pay close attention to the packing guidance from your tour leader! It really will make your trip much more enjoyable. Do you have other packing tips for a European vacation? We’d love to hear them!